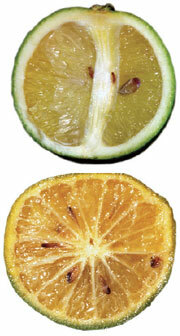 GREENING of citrus or huanglongbing disease affects oranges, kinnows, lemons and other members of the citrus family. The bacterial infection, characterised by yellow leaves and unripe green fruits, is difficult to detect. A recent study offers insight into how the disease might be detected early in sweet oranges. The disease does not have specific symptoms. Farmers often get confused if their trees are struck by huanglongbing, or it is iron and zinc deficiency turning fruits green and leaves yellow. Delay in treatment usually aggravates the disease. Pesticides don’t help always and farmers have no option but to destroy the tree, which means losses. Northeast India is the centre of origin for citrus and diseases such as citrus greening put the trees in the country at risk. “Sathdudi, a sweet orange variety, is grown in 171,991 hectares in Andhra Pradesh and losses due to the disease exceed Rs 100 crore annually,” said K Gopal, senior scientist at the Citrus Research Station in Tirupati. He has researched on the disease in two citrus varieties, sweet orange and acid lime, since 1998. Mandarin, the third citrus variety, is grown in northeastern India, Maharashtra, Karnataka and Punjab. All the three varieties are susceptible to the disease, said Ashis K Das, senior scientist at the National Research Centre for Citrus in Nagpur. Sweet oranges and mandarins are more susceptible, he added. Gopal and his team took tree samples from Anantapur, Chittoor, Cuddapah, Nellore and Prakasam districts of Andhra Pradesh for their study, published in Archives of Phytopathology and Plant Protection on June 10. They examined the trees for visible symptoms: yellow leaves and green fruits. They collected infected leaf samples and isolated DNA. The DNA was amplified through a molecular biological technique called PCR or polymerase chain reaction. Confirmation of the disease was possible in cases when a specific fragment of the bacterial DNA could be amplified. PCR serves two functions: it helps identify the affected plants at early stages of infection and differentiates between zinc-deficient and huanglongbing- affected plants. The National Research Centre for Citrus in Nagpur has also been using the PCR method for the mandarin and sweet orange citrus varieties. Scientists in Nagpur and Tirupati have also established disease-free certification centres for citrus. In these centres, or orchards, scientists grow thousands of citrus plants that act as mother trees. These provide healthy planting material called budlings. Before supplying budlings to orchardists all mother trees are tested for infection through PCR-based detection method. Earlier the disease was detected by growing the budling for about six weeks and looking for appearance of symptoms. With PCR, detection time has reduced from six weeks to six hours. Since 1997 the centre at Tirupati has supplied more than 600,000 certified budlings; Nagpur has supplied more than 150,000 certified budlings since 2000. “Most farmers who have expanded their orchards with certified budlings from our centre have benefitted and are happy. They get Rs 2-3 lakh per hectare after six years,” Gopal said. V K Baranwal, principal scientist at the division of Plant Pathology at Indian Agricultural Research Institute said the state agriculture and horticulture departments must make disease-free certification mandatory for any plant material sold by nurseries. “This is important because an uncertified plant material used for propagation would mean a new plant is also infected right from inception,” he added.